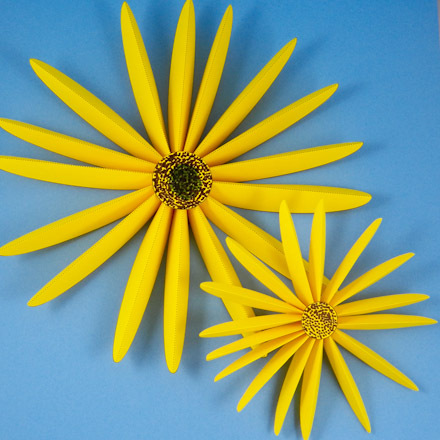 In this 3D paper craft, you will make a life-size paper sunflower blossom. 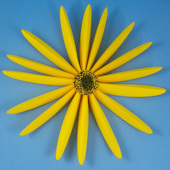 The flower petals are made in sections and then joined together to make a 10" sunflower. These large blossoms make terrific decorations for a party or event, and work well on bulletin boards, windows or in a child's playroom. The project also includes patterns for smaller sunflowers that can be used to decorate gifts or add a warm glow to your dinner table. Related crafts: See how easy it is to freehand-cut Paper Flowers or create a Spring Flower Bouquet using printable patterns. Choose which size of sunflower you want to make. Download and print the pattern. For the 10" Sunflower, you need to print 2 copies of the pattern. Print black & white patterns on yellow paper and colored patterns on white paper. Select one of the Sunflower Extras patterns to add leaves and/or butterflies to your sunflowers. Cut out the petal sections. On the 10" pattern, there are two sections back-to-back, and on the 6" pattern there are four sections in two back-to-back sets. You need four petal sections to make one sunflower. Cut out one circle piece for each flower. 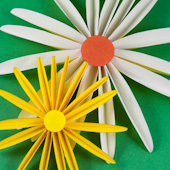 Tip: First, cut the two sections of four petals apart on the dark center line, then cut around the petals. DO NOT cut the petals apart! Fold each section of petals in an accordion manner. With the printed side up, make mountain folds in the center of each petal, and valley folds between the petals. A mountain fold has the fold crease pointing up and a valley fold has the fold crease pointing down. Repeat with the other three sections of petals. Place a 1" (2.5 cm) piece of tape around the base of each petal section from one outside petal to the other outside petal. After taping, the sections are L-shaped. Turn the petal sections wrong-side up (printed side down). Place a ¾" (2 cm) piece of tape inside the first petal near the base, with the sticky side facing out. Line another petal section up beside the one with the tape sticking up. Fold the tape down into the outer petal on the second section. Repeat with the other sections, taping the last section to the first section. Turn the flower right-side up. The flower is a little floppy at this stage. 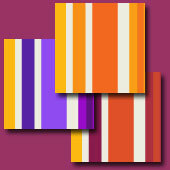 If you printed a black & white pattern, color the center piece with a brown crayon or marker. It's okay if the center is not covered completely. Turn the center over and put a generous amount of glue on the back. Gently run the glue stick over the creases in the center of the flower. Hold the center by the edges and place it glue side down in the center of the flower. Press the center down lightly. Be sure the glued surface is touching all the petals. Allow the glue to dry. Tip: To create a strong glue bond, turn the flower (with glued center) face-down on a non-stick surface (waxed paper) and weigh the flower down with a small paperback book or a small pad of paper. 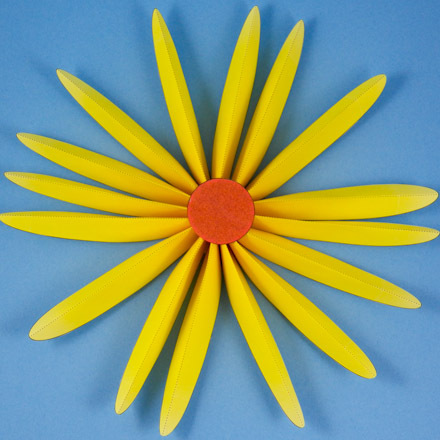 Tip: The second center circle can be glued to the back of the flower. This will make the flower firmer, and creates a more finished look for sunflowers that are hung as a garland. 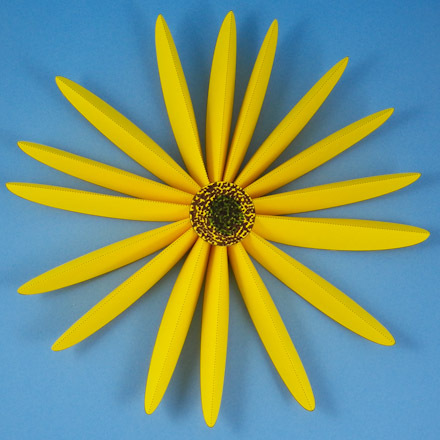 The finished sunflower can be propped on a shelf or hung with tape or a push pin. You can also string sunflowers together to form a bright and cheerful garland. 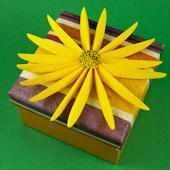 Or, use the sunflower as a beautiful gift package topper. Project extra: Print the Sunflower Extras pattern with leaves and butterflies. Cut out the leaves for your size of sunflower, crease lightly on the center line and glue to the center back. Before cutting out the butterflies make them double-sided—cut out the rectangle around the butterfly of your choice, fold in half on the dashed line and glue. 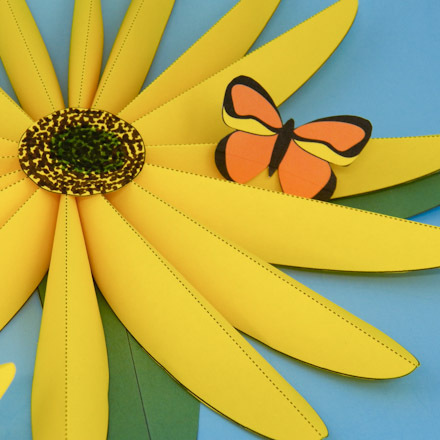 Cut out the butterfly, fold the wings up and glue to the sunflower. That's it! Your sunflower is done! 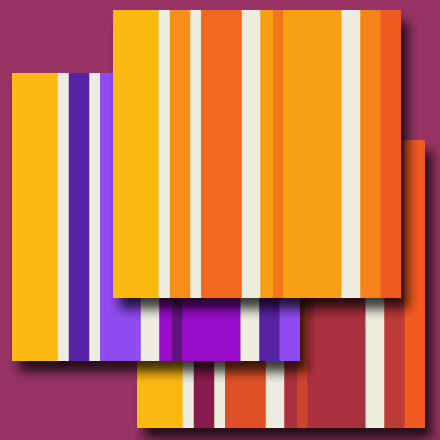 Tip: Download and print the Golden Stripes digital papers in three variations: Golden Stripes, Golden Red Stripes and Golden Plum Stripes. 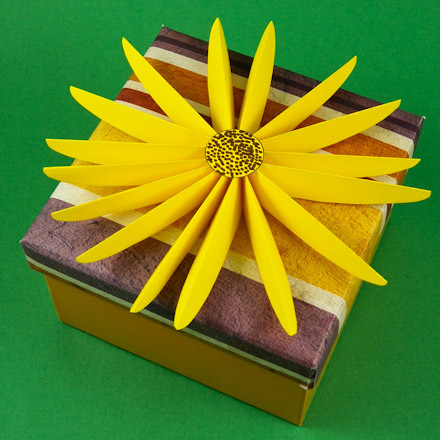 Use the papers to make Boxes and Bags or to wrap gifts that coordinate with Paper Sunflowers. Thanks to Janet LaFara for creating the original version of this craft for Aunt Annie's Craft Page in 1997. Tip: The 6" sunflower makes a nice decoration on gift packages. 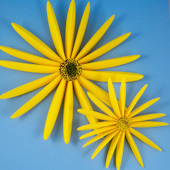 Tip: Print the black & white patterns on yellow paper for sunflowers that are bright and colored on both sides! Tip: If you don't have yellow computer paper, print the colored patterns on white paper. The front is yellow, but the back of the flower is white. Tip: A center can also be glued to the back of the sunflower. This gives a more finished look to the back of sunflowers strung in a garland or hung by a string. 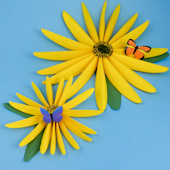 Tip: Add leaves and butterflies to your sunflower from the Sunflower Extras pattern.